There are many things one can do to save energy that cost nothing other than the effort needed to change the way we do things. Many of us had parents who always told us to always turn off the lights when we leave a room, but turning out the lights is only the start of being more efficient with how we use our energy resources. For most homes, the single largest consumer of energy is their heating and cooling system. 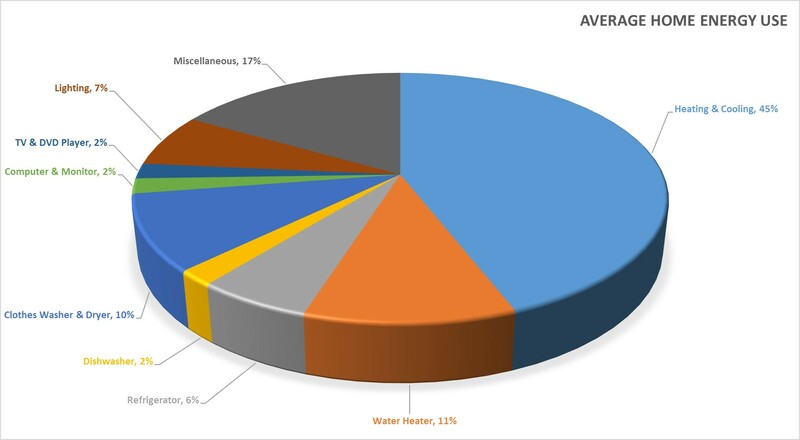 As indicated in Figure 1, the average Indiana household spends 45% of its energy budget on heating a cooling. Other significant energy consumers are water heating, laundry, and refrigerators & freezers. While expensive and flashy technologies like photovoltaic panels and solar water heaters can directly and significantly reduce the amount of electricity one is buying from their utility provider, the first, most cost effective, and important step is to look at your home, appliances, and habits and decide how you can be more efficient today while spending little or no money. This section will provide a brief guide on some of the changes you can make in your home to make it more energy efficient, from determining if an older appliance will be cost effective to replace to changes you can make in your day to day actions that could have significant long-term effects on your energy use. Vectren offers a variety of energy-saving tips for both homeowners and renters on their website. Indiana Michigan Power & Light offers, in partnership with local libraries, the ability to rent out Kill-A-Watt meters, so homeowners can track how much energy specific devices are using. The Energy Star website and US Department of Energy website offers many resources for the homeowner wishing to get serious about energy efficiency, as do the Natural Resource Defense Council and American Council for an Energy Efficient Economy.